Vet Visit! Breathing is Connection. Emergency vet call! One of my boarded horses is sick. He’s a draft cross, timid but kind. He likes things to move in horse time. When the vet and his tech arrived, they hurried into his run. He remembers vets and tries to be good, but needles scare him. Intruders moving fast scare him. By moving fast, I mean at a normal walk. The tech was new, she didn’t know us here. She immediately took a firm hold on the lead rope. No one around here holds a rope tight. It can cue a horse to pull back. “He’ll be fine, go slow,” I say. She flashes me the “I’m a professional” look. That’s fair. So by now, the horse’s eyes are wide and he is a bit taller than his usual 17 hands–tense and barely breathing. And the vet is taking vital signs as the tech tries to stabilize his huge head. The horse is slightly alarmed–he’s used to doing that himself. Disclaimer: I love vet techs. I’ve done time in her shoes. It’s hard work with miserable hours, and job one is to manage the horse in such a way that the vet is safe. No one wants techs or vets injured and sick horses are not predictable. To tell the truth, lots of the horses they work on are dangerous because of little or no training. It’s a very challenging job and I appreciate her. So the tech grips the lead rope right at the clip and is holding fast. The horse is resisting her resistance. And one other small detail; the circumference of his neck is twice her waist size. This isn’t a fair fight–he could launch her over the barn. She is facing the horse’s hind, toward the vet, who’s prepping an injection now. The good horse is wide-eyed and electric. This makes the vet a bit tense; he might be remembering this horse in the past. The tech trying to do her best, responds by taking an even tighter hold on the horse. She’s not quite on her tip-toes yet. I am standing about 3 feet in front of the horse, behind the tech’s back. I take a deep breath through my open mouth, counting to three silently. I hold it an instant and then exhale it through my mouth, slow and audible like a sigh–again counting one-two-three. In the middle of this breath, the tech glances over her shoulder at me with brows furrowed. Like I’m crazy or something. I bet she runs into a lot of weird gray-haired women in her day, so I give her the benefit of the doubt and smile mid-exhale. Breath is how we all connect, but especially horses. It’s just that simple. I take a second deep slow inhale and this time the tech doesn’t glance at me, the vet is close to giving the shot but seems to have paused maybe. As I began my third deep breath, the horse dropped his head like a rock. And by drop his head, I mean 12 or 18 inches. The vet tech turned, looking at me full on, like I stole the cake, and began reconsidering gray-haired women. The vet gave the shot with almost no one noticing, finishing the syringe with the end of my exhale. I’m no genius, it’s common sense. If breathing is the most important thing in the saddle, and it is, then it must be twice that important during stress on the ground. It’s an anchor for a horse under sedation, essential for a horse in a bit of shock from an injury, and I believe it absolutely saves lives during a colic. Breathing is one of those things that is its own reward. 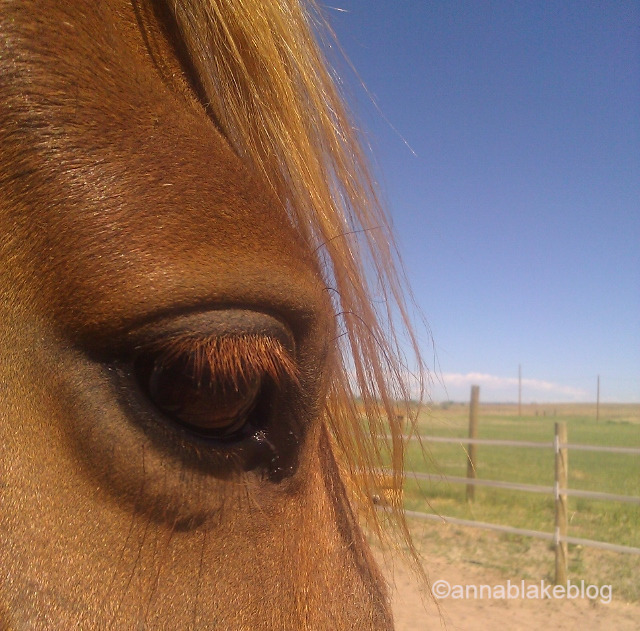 Meaning as you are breathing for your horse, deep to the bottom of your lungs, it is the anti-panic drug for you, too. And you need to be calm for your horse. He doesn’t want to hear you hysterically shrieking, either out loud or inside your mind. It never helps. Sure, it’s hard to see a horse in pain. We might be stuck on the spot, but even if we can’t move our feet, we can be strong in our breath. The meaning of breath is much deeper than words. The thread of his life began with a first inhale and his dam and herd answered him. So, we share our horse/human breath back and forth every day, in ancient horse language, to let him know he is safe. And if you are very lucky, if you are the very best partner, when the time comes to say goodbye, you can help him. In that precious moment you can breathe with him, the same breath you shared in a lifetime of laughter and tears and warm sun on his neck. There is no finer salute for a good horse than to share that last breath. Because just like all the other times, breath is how we connect. It works like money in the bank, thanks for the affirmation! It is the most counter-intuitive thing to do, to release and breathe! Good for your horse though. Thanks. I remind myself to BREATHE when I’m about to go into the show ring, or talk to someone or sometimes just feeling closed in. Love the feel of that cue. Wow … You just knocked the wind out of me AND made me cry . Breathe Nina,Breathe . That will be my new mantra. I so look forward to your blog . I learn so much . You are a wonderful teacher. That was absolutely beautiful . Thank you Nina. I appreciate the time you spend reading. This whole horse thing, even the hard parts, are supposed to be beautiful. Wonderful – I am slowly learning this and how powerful this simple shared activity can be – thank you. I’m a believer in the breath! My little filly was sick this past spring. We had to load her in the trailer for a trip to the vet. She was so scared. Maybe I should not have ridden with her in the trailer but I did—anyway– I decided to take slow-long breaths. She immediately responded by calming down and we made a successful ride in the back of the trailer (16 miles) without any incidents! The breath is a wonderful thing when you are so desperately trying to communicate with a sick horse friend! Thank you for this affirmation… and yes, riding is the trailer is an iffy idea… but glad it worked out. This is so appropriate for ALL situations. Thank you, Anna. I loved this post on every level!!!! As I read it I sat and took long, slow breaths……… Thank you for this and all of your posts. Love this! I’m not sure when I stumbled upon the breathing thing, maybe after some holistic visits for myself. I remember taking my Andalusian/Arabian to a show and when he came off the trailer tense and 20 feet tall, I just started telling HIM to breath (yeah, I sounded like a crazy person). I just talked to him and by breathing with him, he started to relax. Lamaze for horses? Whatever, it works and I always thought it was my crazy handling for this one horse. Thanks again for your insights! My two favorite breeds, aka ‘breathe or die’ breeds. Thank you! It is a blessing, to share a whole life. Thanks. Love right back to you and yours. This is just brilliant, but it did leave me wondering if the horse relaxed and if the vet tech learned anything. The horse relaxed and got easy right away. The tech, who knows. I think alot of people see something like this and think it is a random coincidence. Too bad. It’s probably thought that I’m either blasé or very arrogant because when my horse freaks out I usually start to yawn. It’s just a trick I used to unlock my jaw and get a good deep breath, and now it’s a bit of a habit. Beautifully written, as usual! I used to be so intimidated by my (baby doll) of an ottb. First horse. On the ground I’ve refined my technique to include holding the lead rope between thumb and forefinger at any sign of tension. Kind of like the okay sign. And breathing loud, sighing breaths until he joins me. The everything-is-hunky-dory horsey blowing sound also does wonders. Under saddle I sing – relaxation and rhythm. Sometimes your posts are breath-taking though Anna… exquisitly. Thank you. Thank you… and sounds like the art of doing less is working for you. Your horse says thanks too. That sigh reached me to! Oh man, you slayed me with that last paragraph. That is the ultimate challenge; to not let your breath catch in your throat as your heart shatters, but to keep breathing deep and slow. I hope I can remember that . . . I hope I can DO that. I am old so I’ve been in that spot more often than I care to remember. My advice is to focus on the love. There is time to mourn later. That, and practice breathing with the vet, it is scary too. My husband is an equine vet and I have been present for the euthanasia of several of his patients. Doesn’t matter if I’ve never met the horse before; my chest constricts and my heart breaks and the tears come. He has never had to put one of my horses down (yet), but we’ve had to ease the suffering of my dogs and sheep. The older I get, the harder it is on me; I think my heart is getting more and more bruised by death – any death. But for the sake of the animals, I will try to remember the slow, three-count inhale, pause, three-count exhale. They deserve any help I can give…. I understand what you are saying. It is never ever easy. At the same time, every year older I get, I try to find some way to be supportive. And I hope someone breathes along with me when the time comes. Breath is so much more intimate than words… Thanks for the comment. Thank you so much for taking the time to share your thoughts, experience and dare I say wisdom? It makes sense that breath has such a calming effect since we share it with our mother throughout our time in the womb, hearing her every breath until our birth. Every relaxation technique calls for breathing. (*A light bulb goes on)! Your description of the dam and herd sharing in the first audible breath is beautiful as is all of your writing. Thank you for blazing the trail and sharing the lessons you have learned…in a way breathing for us all. Hehe, breathing really is a recurring theme. I have llamas as well and the mom and baby humm to each other thru the birth… so beautiful. Thanks for commenting. Oh goodness….such an amazing story, I had no idea about horses and breathing…and this entire post brought tears to my eyes….you are the best friend a horse could have. Thanks for reading… they are the best friends I have, too. 🙂 I tried the breathing on our cat this afternoon..he seemed to like it.. I started following you last year shortly before I welcomed to my barn a rescued, scared and scarred, 15 year old Arabian mare. Jess went to a trainer for 5 weeks…a trainer who is very slow, kind, and respectful of her charges. I picked Jess up in July and rode her daily for about two months. As I began working again, I spent less time with her…usually only riding her 2-3 times weekly and then down to once weekly. Jess is a very spooky, on “pins and needles” type that needs lots of reassurance. Your breathing advice makes the difference between a wild ride to an occasional jolting spook. As I ride her, I remember to breath deeply and calmly, smiling at my luck to have the opportunity to have had many special equines in my life. Jess needs lots of support both mounted and on the ground…but the addition of the breathing (the reminders are great) to my arsenal of strategies to help Jess has made her (and my confidence) flourish. BTW…I, too, have a grandfather horse that is 30 years old that looks much like your “boy” who is the best friend I’ve ever had. Keep including “breathing” in your blogs…perhaps it will finally sink in to those who struggle. Anna – Thank you so much for this post – riding instructors, massage therapists, dog trainers and chiropractors have been trying to get me to “breathe” for years. I have the word in 12 inch letters in my workshop so I remember. I made myself a bracelet with the word so I would remember. I took up yoga so I would remember. No luck. I realize reading this that I never really knew why breathing was so important. This is, as my beloved instructor Sue would have said, a BFO – blinding flash of the obvious…. So much about riding is counter-intuitive, and breathing is the first thing that changes, usually without noticing. It’s the ‘obvious’ part, invisibly. For me, it got easier when I got clear how much it matters to horses. It’s easier to do something for horses than myself. (It’s the cowgirl way.) Thank you for this wonderful comment. Keep up the good work. I was beyond delighted this fall when I watched my “new” equine dentist deflate my Arab’s resistance and fear with his own breathing technique. He literally stopped what he was doing, centered himself in front of her and gently rested his forehead against hers while he breathed with her for several minutes. I could see her entire demeanor change as the stress left her body. He had the wisdom and patience to repeat this process as much as necessary to get the job done without having to fight, restrain or sedate her. I think I’m in love …. amazing story, please never stop yammering on about breathing. This was amazing how it worked in this case. If the world could just breathe too. I will use this. thank you for your insight and wisdom, thank you for sharing.